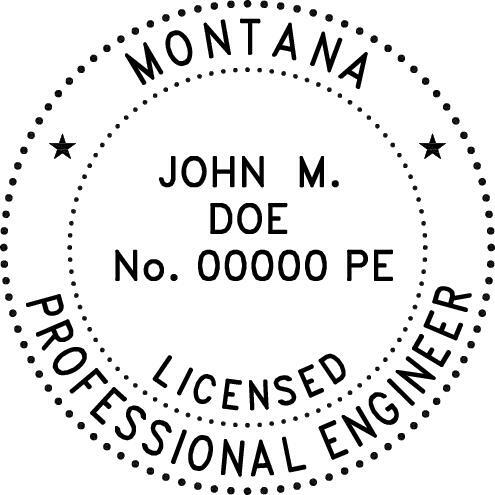 The state of Montana requires the professional engineer stamp to be 2 inches in diameter for rubber stamps, 1 5/8 inches in diameter for pocket embossers, and 2 inches in diameter for desk top embossers. We offer the Montana professional engineer stamp in two size depending on the product to meet state regulations; 2 inches in diameter for everything except the compact and desk embosser. The compact and desk embossers are 1 5/8 inches in diameter. Our desk embosser is 1 5/8 inches in diameter because it is the compact embosser frame that sits in a plastic base for use on a desk, but may be taken with you like the compact embosser. In case you have any questions on the Montana professional engineer stamp requirements or any other regulatory questions, we have included the Montana Engineer boards contact information below for your convenience.